Microwaves are a form of electromagnetic radiation with wavelengths ranging from about one meter to one millimeter; with frequencies between 300 MHz (1 m) and 300 GHz (1 mm). Different sources define different frequency ranges as microwaves; the above broad definition includes both UHF and EHF (millimeter wave) bands. A more common definition in radio engineering is the range between 1 and 100 GHz (wavelengths between 0.3 m and 3 mm). In all cases, microwaves include the entire SHF band (3 to 30 GHz, or 10 to 1 cm) at minimum. Frequencies in the microwave range are often referred to by their IEEE radar band designations: S, C, X, Ku, K, or Ka band, or by similar NATO or EU designations. The prefix micro- in microwave is not meant to suggest a wavelength in the micrometer range. Rather, it indicates that microwaves are "small" (having shorter wavelengths), compared to the radio waves used prior to microwave technology. The boundaries between far infrared, terahertz radiation, microwaves, and ultra-high-frequency radio waves are fairly arbitrary and are used variously between different fields of study. Microwaves travel by line-of-sight; unlike lower frequency radio waves they do not diffract around hills, follow the earth's surface as ground waves, or reflect from the ionosphere, so terrestrial microwave communication links are limited by the visual horizon to about 40 miles (64 km). At the high end of the band they are absorbed by gases in the atmosphere, limiting practical communication distances to around a kilometer. Microwaves are widely used in modern technology, for example in point-to-point communication links, wireless networks, microwave radio relay networks, radar, satellite and spacecraft communication, medical diathermy and cancer treatment, remote sensing, radio astronomy, particle accelerators, spectroscopy, industrial heating, collision avoidance systems, garage door openers and keyless entry systems, and for cooking food in microwave ovens. The short wavelengths of microwaves allow omnidirectional antennas for portable devices to be made very small, from 1 to 20 centimeters long, so microwave frequencies are widely used for wireless devices such as cell phones, cordless phones, and wireless LANs (Wi-Fi) access for laptops, and Bluetooth earphones. 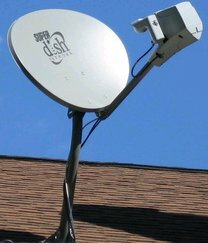 Antennas used include short whip antennas, rubber ducky antennas, sleeve dipoles, patch antennas, and increasingly the printed circuit inverted F antenna (PIFA) used in cell phones. The term microwave also has a more technical meaning in electromagnetics and circuit theory. Apparatus and techniques may be described qualitatively as "microwave" when the wavelengths of signals are roughly the same as the dimensions of the circuit, so that lumped-element circuit theory is inaccurate, and instead distributed circuit elements and transmission-line theory are more useful methods for design and analysis. As a consequence, practical microwave circuits tend to move away from the discrete resistors, capacitors, and inductors used with lower-frequency radio waves. 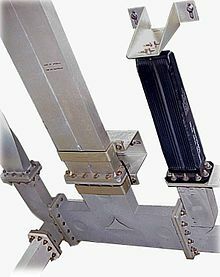 Open-wire and coaxial transmission lines used at lower frequencies are replaced by waveguides and stripline, and lumped-element tuned circuits are replaced by cavity resonators or resonant stubs. In turn, at even higher frequencies, where the wavelength of the electromagnetic waves becomes small in comparison to the size of the structures used to process them, microwave techniques become inadequate, and the methods of optics are used. Wireless LAN protocols, such as Bluetooth and the IEEE 802.11 specifications used for Wi-Fi, also use microwaves in the 2.4 GHz ISM band, although 802.11a uses ISM band and U-NII frequencies in the 5 GHz range. Licensed long-range (up to about 25 km) Wireless Internet Access services have been used for almost a decade in many countries in the 3.5–4.0 GHz range. The FCC recently[when?] carved out spectrum for carriers that wish to offer services in this range in the U.S. — with emphasis on 3.65 GHz. Dozens of service providers across the country are securing or have already received licenses from the FCC to operate in this band. The WIMAX service offerings that can be carried on the 3.65 GHz band will give business customers another option for connectivity. During World War II, it was observed that individuals in the radiation path of radar installations experienced clicks and buzzing sounds in response to microwave radiation. This microwave auditory effect was thought to be caused by the microwaves inducing an electric current in the hearing centers of the brain. Research by NASA in the 1970s has shown this to be caused by thermal expansion in parts of the inner ear. In 1955 Dr. James Lovelock was able to reanimate rats chilled to 0-1°C using microwave diathermy. 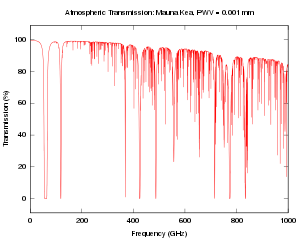 In 1894, Oliver Lodge and Augusto Righi generated 1.5 and 12 GHz microwaves respectively with small metal ball spark resonators. The same year Indian physicist Jagadish Chandra Bose was the first person to produce millimeter waves, generating 60 GHz (5 millimeter) microwaves using a 3 mm metal ball spark oscillator. 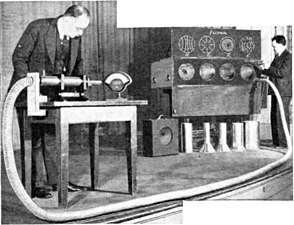 Bose also invented waveguide and horn antennas for use in his experiments. 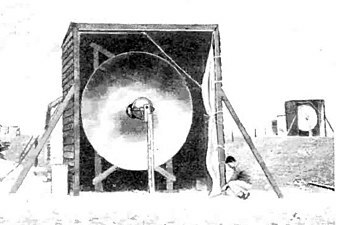 Russian physicist Pyotr Lebedev in 1895 generated 50 GHz millimeter waves. In 1897 Lord Rayleigh solved the mathematical boundary-value problem of electromagnetic waves propagating through conducting tubes and dielectric rods of arbitrary shape. which gave the modes and cutoff frequency of microwaves propagating through a waveguide. 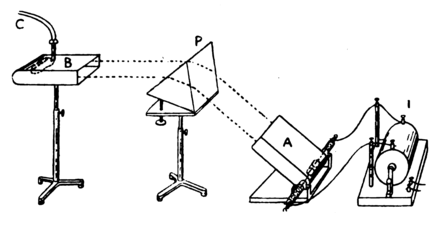 However, since microwaves were limited to line of sight paths, they could not communicate beyond the visual horizon, and the low power of the spark transmitters then in use limited their practical range to a few miles. The subsequent development of radio communication after 1896 employed lower frequencies, which could travel beyond the horizon as ground waves and by reflecting off the ionosphere as skywaves, and microwave frequencies were not further explored at this time. Practical use of microwave frequencies did not occur until the 1940s and 1950s due to a lack of adequate sources, since the triode vacuum tube (valve) electronic oscillator used in radio transmitters could not produce frequencies above a few hundred megahertz due to excessive electron transit time and interelectrode capacitance. By the 1930s, the first low power microwave vacuum tubes had been developed using new principles; the Barkhausen-Kurz tube and the split-anode magnetron. These could generate a few watts of power at frequencies up to a few gigahertz, and were used in the first experiments in communication with microwaves. 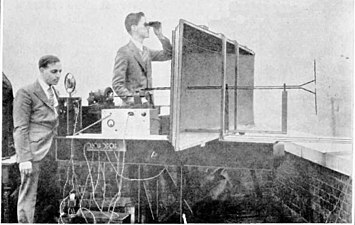 In 1931 an Anglo-French consortium demonstrated the first experimental microwave relay link, across the English Channel 40 miles (64 km) between Dover, UK and Calais, France. 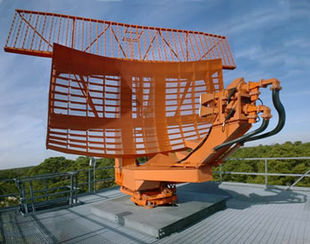 The system transmitted telephony, telegraph and facsimile data over bidirectional 1.7 GHz beams with a power of one-half watt, produced by miniature Barkhausen-Kurz tubes at the focus of 10-foot (3 m) metal dishes. After World War 2, microwaves were rapidly exploited commercially. Due to their high frequency they had a very large information-carrying capacity (bandwidth); a single microwave beam could carry tens of thousands of phone calls. In the 1950s and 60s transcontinental microwave relay networks were built in the US and Europe to exchange telephone calls between cities and distribute television programs. 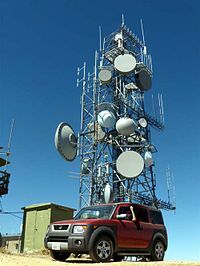 In the new television broadcasting industry, from the 1940s microwave dishes were used to transmit backhaul video feed from mobile production trucks back to the studio, allowing the first remote TV broadcasts. The first communications satellites were launched in the 1960s, which relayed telephone calls and television between widely separated points on Earth using microwave beams. 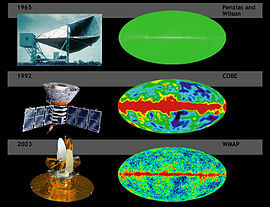 In 1964, Arno Penzias and Robert Woodrow Wilson while investigating noise in a satellite horn antenna at Bell Labs, Holmdel, New Jersey discovered cosmic microwave background radiation. C-band horn antennas at a telephone switching center in Seattle, belonging to AT&T's Long Lines microwave relay network built in the 1960s. 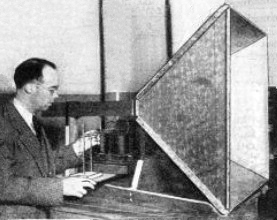 The ability of short waves to quickly heat materials and cook food had been investigated in the 1930s by I. F. Mouromtseff at Westinghouse, and at the 1933 Chicago World's Fair demonstrated cooking meals with a 60 MHz radio transmitter. In 1945 Percy Spencer, an engineer working on radar at Raytheon, noticed that microwave radiation from a magnetron oscillator melted a candy bar in his pocket. He investigated cooking with microwaves and invented the microwave oven, consisting of a magnetron feeding microwaves into a closed metal cavity containing food, which was patented by Raytheon on 8 October 1945. Due to their expense microwave ovens were initially used in institutional kitchens, but by 1986 roughly 25% of households in the U.S. owned one. 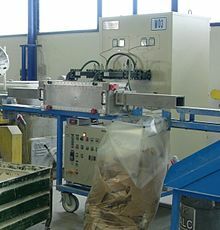 Microwave heating became widely used as an industrial process in industries such as plastics fabrication, and as a medical therapy to kill cancer cells in microwave hyperthermy. Radar speed gun. At the right end of the copper horn antenna is the Gunn diode (grey assembly) which generates the microwaves. Prior to the 1970s microwave devices and circuits were bulky and expensive, so microwave frequencies were generally limited to the output stage of transmitters and the RF front end of receivers, and signals were heterodyned to a lower intermediate frequency for processing. The period from the 1970s to the present has seen the development of tiny inexpensive active solid state microwave components which can be mounted on circuit boards, allowing circuits to perform significant signal processing at microwave frequencies. This has made possible satellite television, cable television, GPS devices, and modern wireless devices, such as smartphones, Wi-Fi, and Bluetooth which connect to networks using microwaves. ^ Hitchcock, R. Timothy (2004). Radio-frequency and Microwave Radiation. American Industrial Hygiene Assn. p. 1. ISBN 978-1931504553. ^ a b Kumar, Sanjay; Shukla, Saurabh (2014). Concepts and Applications of Microwave Engineering. PHI Learning Pvt. Ltd. p. 3. ISBN 978-8120349353. ^ Jones, Graham A.; Layer, David H.; Osenkowsky, Thomas G. (2013). National Association of Broadcasters Engineering Handbook, 10th Ed. Taylor & Francis. p. 6. ISBN 978-1136034107. ^ Pozar, David M. (1993). 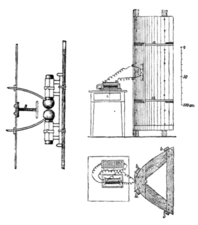 Microwave Engineering Addison–Wesley Publishing Company. ISBN 0-201-50418-9. ^ Sorrentino, R. and Bianchi, Giovanni (2010) Microwave and RF Engineering, John Wiley & Sons, p. 4, ISBN 047066021X. ^ a b Seybold, John S. (2005). Introduction to RF Propagation. John Wiley and Sons. pp. 55–58. ISBN 978-0471743682. ^ a b Golio, Mike; Golio, Janet (2007). RF and Microwave Passive and Active Technologies. CRC Press. pp. I.2–I.4. ISBN 978-1420006728. ^ a b Sisodia, M. L. (2007). Microwaves : Introduction To Circuits, Devices And Antennas. New Age International. pp. 1.4–1.7. ISBN 978-8122413380. ^ Liou, Kuo-Nan (2002). An introduction to atmospheric radiation. Academic Press. p. 2. ISBN 978-0-12-451451-5. Retrieved 12 July 2010. ^ "IEEE 802.20: Mobile Broadband Wireless Access (MBWA)". Official web site. Retrieved August 20, 2011. ^ "The way to new energy". ITER. 2011-11-04. Retrieved 2011-11-08. ^ "Electron Cyclotron Resonance Heating (ECRH)". Ipp.mpg.de. Archived from the original on 2011-09-27. Retrieved 2011-11-08. ^ "Frequency Letter bands". Microwave Encyclopedia. Microwaves101 website, Institute of Electrical and Electronic Engineers (IEEE). 14 May 2016. Retrieved 1 July 2018. ^ Golio, Mike; Golio, Janet (2007). RF and Microwave Applications and Systems. CRC Press. pp. 1.9–1.11. ISBN 978-1420006711. ^ "eEngineer – Radio Frequency Band Designations". Radioing.com. Retrieved 2011-11-08. ^ PC Mojo – Webs with MOJO from Cave Creek, AZ (2008-04-25). "Frequency Letter bands – Microwave Encyclopedia". Microwaves101.com. Retrieved 2011-11-08. ^ For other definitions see Letter Designations of Microwave Bands. ^ Nave, Rod. "Interaction of Radiation with Matter". HyperPhysics. Retrieved 20 October 2014. ^ Goldsmith, JR (December 1997). "Epidemiologic evidence relevant to radar (microwave) effects". Environmental Health Perspectives. 105 (Suppl. 6): 1579–1587. doi:10.2307/3433674. JSTOR 3433674. PMC 1469943. PMID 9467086. ^ Andjus, R.K.; Lovelock, J.E. (1955). "Reanimation of rats from body temperatures between 0 and 1 °C by microwave diathermy". The Journal of Physiology. 128 (3): 541–546. doi:10.1113/jphysiol.1955.sp005323. PMC 1365902. PMID 13243347. ^ "Resources for You (Radiation-Emitting Products)". US Food and Drug Administration home page. U.S. Food and Drug Administration. Retrieved 20 October 2014. ^ Hong, Sungook (2001). Wireless: From Marconi's Black-box to the Audion. MIT Press. pp. 5–9, 22. ISBN 978-0262082983. ^ a b c d e f g h i j k l m n o p q r s t u Roer, T.G. (2012). Microwave Electronic Devices. Springer Science and Business Media. pp. 1–12. ISBN 978-1461525004. ^ a b c d e Sarkar, T. K.; Mailloux, Robert; Oliner, Arthur A. (2006). History of Wireless. John Wiley and Sons. pp. 474–486. ISBN 978-0471783015. ^ Emerson, D.T. (February 1998). "The work of Jagdish Chandra Bose: 100 years of MM-wave research". National Radio Astronomy Observatory. ^ a b Packard, Karle S. (September 1984). "The Origin of Waveguides: A Case of Multiple Rediscovery" (PDF). IEEE Transactions on Microwave Theory and Techniques. MTT-32 (9): 961–969. Bibcode:1984ITMTT..32..961P. CiteSeerX 10.1.1.532.8921. doi:10.1109/tmtt.1984.1132809. Retrieved March 24, 2015. ^ Strutt, William (Lord Rayleigh) (February 1897). "On the passage of electric waves through tubes, or the vibrations of dielectric cylinders". Philosophical Magazine. 43 (261): 125–132. doi:10.1080/14786449708620969. ^ Kizer, George (2013). Digital Microwave Communication: Engineering Point-to-Point Microwave Systems. John Wiley and Sons. p. 7. ISBN 978-1118636800. ^ Lee, Thomas H. (2004). Planar Microwave Engineering: A Practical Guide to Theory, Measurement, and Circuits, Vol. 1. Cambridge University Press. pp. 18, 118. ISBN 978-0521835268. ^ a b Free, E.E. (August 1931). "Searchlight radio with the new 7 inch waves" (PDF). Radio News. Vol. 8 no. 2. New York: Radio Science Publications. pp. 107–109. Retrieved March 24, 2015. ^ Ayto, John (2002). 20th century words. p. 269. ISBN 978-7560028743. ^ Riordan, Michael; Lillian Hoddeson (1988). Crystal fire: the invention of the transistor and the birth of the information age. US: W. W. Norton & Company. pp. 89–92. ISBN 978-0-393-31851-7. ^ "Cooking with Short Waves" (PDF). Short Wave Craft. 4 (7): 394. November 1933. Retrieved 23 March 2015. ^ Kurokawa, K. (July 1969). "Some Basic Characteristics of Broadband Negative Resistance Oscillator Circuits". Bell System Tech. J. 48 (6): 1937–1955. doi:10.1002/j.1538-7305.1969.tb01158.x. Retrieved December 8, 2012.